Early Release: Wizards has announced that War of the Spark booster boxes will have a special preorder perk – you will be able to get your boxes of boosters a week early during Prerelease Weekend – while supplies last (so pre-order if you can)! War of the Spark Exclusive Buy-a-Box Card: On top of that you will get the Standard-Legal buy-a-box promo card which will be exclusively available as a buy-a-box card – there will be no other way to get it. 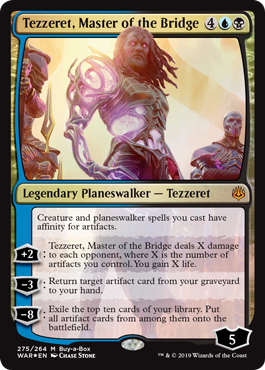 The card is ‘Tezzeret, Master of the Bridge‘, which may be the most exciting Buy-a-Box promo yet. It will be limited to the first batch of people who order or buy a box of War of the Spark from Black Knight Games. Hero’s Rewards: When you pre-order before pre-release weekend you will also get 2 Hero’s Rewards! Pay with Hero’s Rewards: Have you been saving up those Hero’s Rewards from the events you’ve been attending? Well you can always trade us 40 Hero’s Rewards and get a booster box for free! So you can take advantage of this special using Hero’s Rewards! So get us those orders for your War of the Spark booster boxes in soon to guarantee yourself one of the early boxes, with buy-a-box promo and Hero’s Rewards, for a better price!